Are you ready to take on oceans of experiences? Let yourselves be surrounded by sharks, see the seals gambol in their element, row in a kayak on the deep Arctic Ocean and learn more about, how you take good care of the oceans. No matter if you prefer to be a dryshoed observer or to be thrown out on deep water in a diving suit, Kattegatcentret is ready with oceans of memorable experiences! In the tropical shark tank the big rays splash around in the surface while shark fins cut through the water and the menacing sets of teeth rip flatfish out of the animal keeper’s hand. You can stand so close that you get water in your hair - or watch from the shark tunnel, where the distance between you and the sharks is only 6 cm. You can also experience our unique shark training, where you can really gain an insight into the fascinating animals. Did you know that Kattegatcentret contains more than 250 different animal species from the whole world? 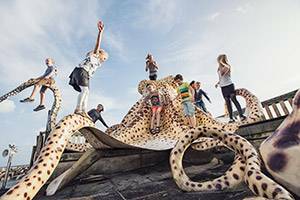 Experience everything from fascinating sharks, hot herrings and fierce Atlantic wolffish to colourful coral fish, poisonous lionfish and cute seals. 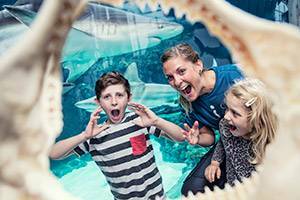 Our many open aquariums offer a bombardment of the senses with water splashes, smells and sounds - and in our touch pools you can "pet" a shark, play hide-and-seek with the flatfish and hold hands with starfish and crabs. Throw yourselves out in the deep end and dive with sharks! If you wish to come very close to the fascinating sharks, you can throw yourselves out in the deep end and down to the sharks. 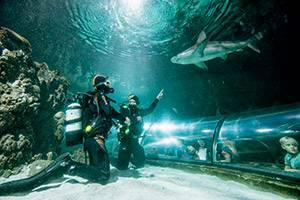 Take a test dive in our 1.5 million litres Oceanarium and establish eye contact with five species of sharks. Certified divers can dive in the shark tank, where the big tropical sharks await you! 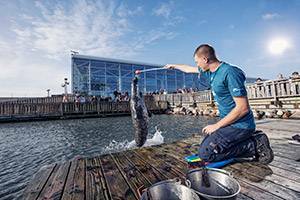 Read more about opening hours and dive down in the many experiences at www.kattegatcentret.dk!